There are plants that puzzle me when they turn up in the garden, because I don’t know what they are. There are plants that alarm me like the Bindweed that is wriggling its way over the fence. And then there are plants that fill me with delight. When I realised that I had Comfrey in the garden, with its long grey-green leaves and pendulous creamy-purple flowers, I greeted it as a long-lost friend. Many years ago, I worked in Dundee, in Scotland. My boyfriend was a herbalist, and a keen cyclist. I had never learned to ‘go a bike’, but I was determined to learn. Needless to say I fell off, a lot. Whenever I did, Colin would reach for a strange, brown, mucilaginous ointment that he’d made from what he called Knitbone, and which I later realised was made from Comfrey root. To me, it seemed like a miraculous balm. Swelling and bruising reduced within hours. I watched as Colin used the ointment when one of the pigs in the city farm that we worked on developed a sore foot. She was walking without limping within a day. 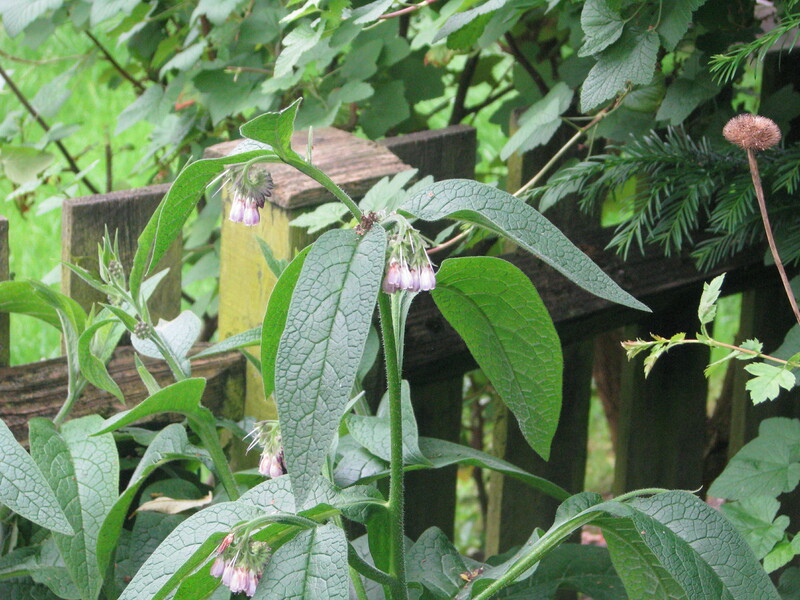 I later learned that Comfrey contains a substance called allantoin, which promotes healing in connective tissue. 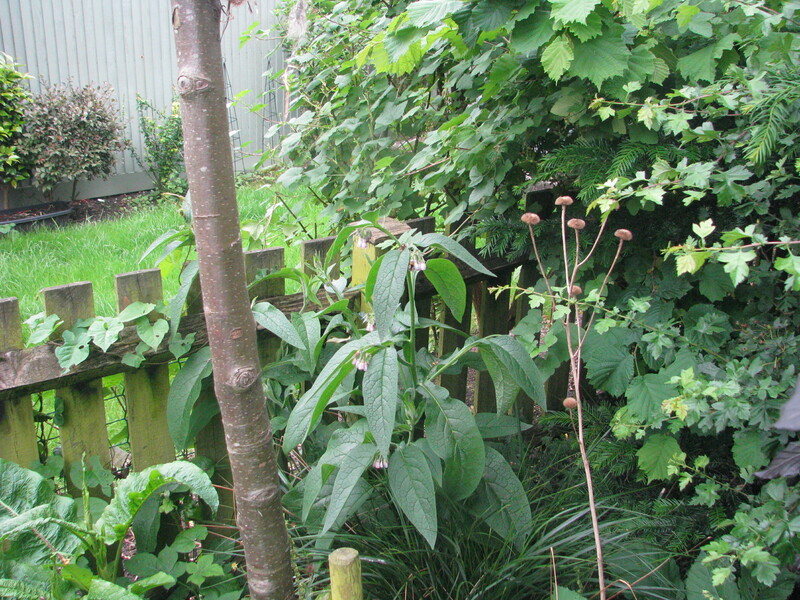 Here you can see the comfrey and also, creeping along the fence, the Bindweed that is certainly going to be a Wednesday Weed in the very near future…. Comfrey is a favourite with bees. After they have finished at the thistles, the bumblebees make a detour to feed on the Comfrey for their dessert. At the moment, the plant is in prime condition, but in a few weeks’ time it will start to look a little dishevelled, with fallen petals and pollen all over those fine leaves. You can get some cultivated versions of Comfrey, which are a little longer-lived and better behaved, but I rather like these volunteer plants, who arrive in the garden with no warning and flourish in awkward spots where other plants would fail. For the organic gardener, Comfrey is a wonder plant – it has a deep taproot which ‘mines’ the ground for minerals, particularly nitrogen and potassium, and so it can be used to improve the soil by putting these elements back. You can create a liquid fertilizer by stuffing a dustbin full of Comfrey leaves and leaving it to rot down – it will produce a thick black ‘goo’ which can be diluted one part to twenty with water. However, the evidence on the Internet suggests that this smells like ‘rotting corpses’, so you might want to take this into account if you have a small garden, neighbours in close proximity and a delicate stomach. I would be interested to hear if you have attempted this process, and if so, if you still have any friends. For those who are faint of heart, Comfrey can also be used as a mulch or a green manure, which seems a little more user-friendly. However, as I have only one Comfrey plant, I will be gazing at it with unbridled admiration and enjoying the bees that it attracts. By now, it probably has roots about three feet deep and will be difficult to dig out, even if I should have such an uncivilised thought. It reminds me of my younger, more reckless self, who was prepared to jump on a bike even if it meant falling off, and it fills me with a bittersweet nostalgia for those days long gone. Our lives go by so quickly and yet, here it is again, Comfrey in bloom, busy with bees. So much changes and yet so much stays the same. This entry was posted in London Plants on June 4, 2014 by Bug Woman. Many of my elder plant teachers have always stated that a new and wild plant comes to live by your house when you need their services. May it be for memories or medicines, there she is. Marla, that’s lovely….thank you. I’m down in Dorset with my eighty year-old parents at the moment, and my father is having terrible problems with pains in his legs, particularly the tendons, and of course that is one of Comfrey’s special healing gifts. I wish I’d made the connection before I came to see them, but at least I’ve made it now…. So glad. I live in the U.S. And have found this advice very helpful. Both motherwort and nettle have come to visit me at the most helpful time! I so enjoyed your article. Do enjoy your comfrey while it’s at its flourishing finest Viv! Mine’s died down for winter here now, and is looking like Cinderella after the spell wore off. Have been using crushed comfrey-leaf poultices for bruises for more than 30 years—for myself and for my daughter. And in compost. At this house, where I’ve lived for 20 years, I planted a child of one of my original plants, and it comes up next to a rose bush without fail every year in a lovely extravagant clump of leaves, with its stalks of lovely little mauve bell-like flowers. Such a hardy plant. And it’s popped up in other places around the garden too. I agree—I like volunteers. They know just where they’ll be happiest. When I really got into herbs in the late 70s, I LOVED that its common name was knitbone! The bees and I are enjoying the comfrey a lot! It’s tucked away in a tangle of Herb Robert and thistle in the wildest corner of the garden. Funny to think of summer just ending in your part of the world when it’s just kicking off here…. Had a lovely bee watching session next to a clump of Comfrey growing by a stream on the water meadows nearby recently.